Thomas Edward Patrick Brady Jr., better known as Tom Brady, is a quarterback for the New England Patriots of the American National Football League. With accolades like six Super Bowl championships, four Super Bowl MVPs, and three NFL MVPs, Brady is considered to be one of the best quarterbacks in the history of NFL. Even at the age of 41, Brady had managed to stay as quick and explosive as he was when he started. 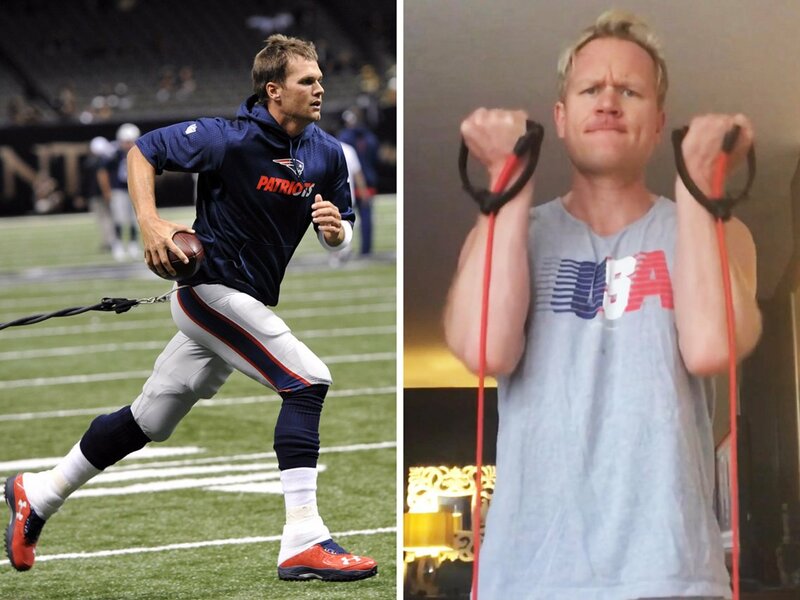 So what does the 14-time Pro Bowl winner do to keep his body in such incredibly athletic shape? Brady focuses on muscle pliability, which means working more on flexibility and less on brute strength. He follows a training routine called the “TB12 Method” that was designed by his business partner and trainer Alex Guerrero. The workout program helps him prevent injuries by keeping his muscles soft, active, and flexible, which is somewhat different from the traditional cardio and weight training that the sprinters and bodybuilders do. So how does he exercise? Although Tom Brady does not squat or bench press a heavy load in order to gain muscle size, he does not totally forgo weight training. He incorporates equipment like elastic resistance bands, vibrating foam rollers, and massage balls, following each workout with specific massages. Thus, Tom improves muscle functionality and keeps his muscles soft without applying much pressure on his joints. He includes the following workouts in his daily routine. Aside from working his muscles, Brady works his brain by improving his attention span, visual and auditory processing, and mindfulness. 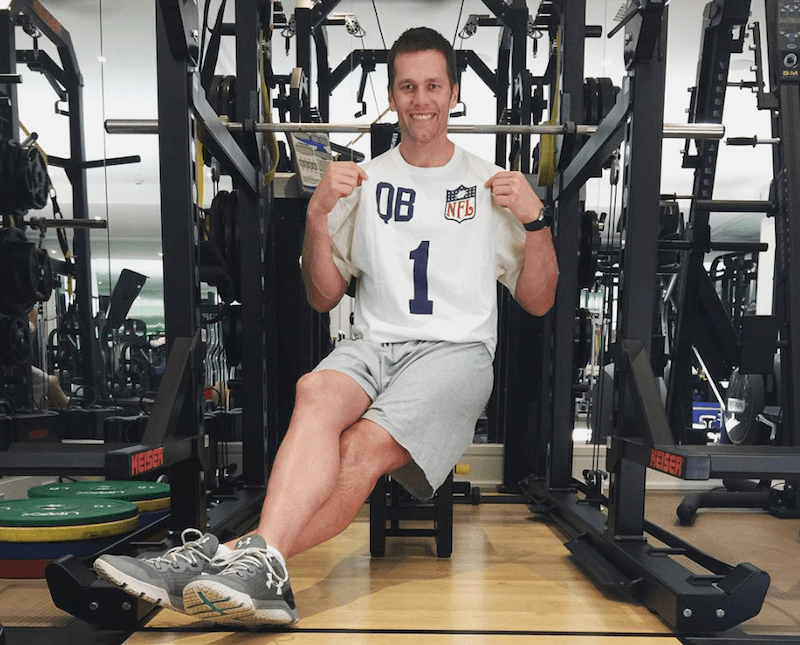 Brady writes in his exercise and diet book “The TB12 Method” that no matter how much you exercise or work out in the gym, you are not going to be successful as an athlete unless you eat the right food and provide your body with the right nutrients. He follows an alkalizing, anti-inflammatory diet, which he believes increases energy, boosts athletic performance and helps speed up recovery. He eats organic, plant-based foods and avoids having any processed items. His list of restricted food items include gluten-containing pasta and bread, corn, breakfast cereal, dairy, foods with GMOs, artificial sweeteners, trans fats, sugar, high-fructose corn syrup, fruit juice, sweetened drinks, soy, jams and jellies, salty snacks, white potatoes, frozen dinners, ketchup, soy sauce, and most cooking oils. He also keeps away from nightshade vegetables like tomatoes, peppers, and eggplants.